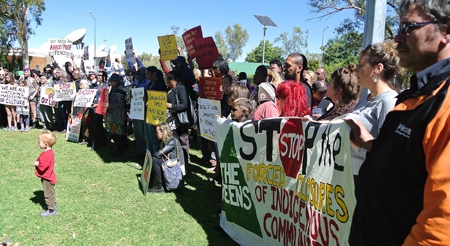 It was fire and brimstone at noon today when a crowd of some 200 listened to prominent Aboriginal activists on the council lawns, thundering about the possible closure of remote communities in Western Australia. Whites – mostly alternative lifestyle persons, to judge by their colourful attire – outnumbered blacks, much to the chagrin of some speakers. One said Aborigines will travel thousands of kilometers to a football fixture but won’t come to a rally like this. Tangentyere boss Walter Shaw said people who are in the pub “should be here”. Harold Furber made the sad announcement that the local stolen generations NGO is closing its doors today because of funding cuts, and nine jobs will be lost. 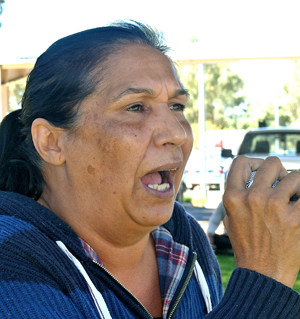 Patricia Morton-Thomas, of 8MMM television fame, said the WA proposals are “the biggest land grab” since the 1770s. She said she had a nephew who died in custody [Kwementyaye Briscoe], that white culture was one of “beer and barbecues” which her culture would easily “wipe off the face of the earth”, and that sheep and cattle had made the land barren and desolate. Town Council elected member Chansey Paech, who introduced himself as an Eastern Arrernte person, said white people are taking away Aboriginal land to make money from it. The current NT Budget was handed down on a “day of shame” – doing little for Aboriginal people living in “poverty and squalor,” said Cr Paech. 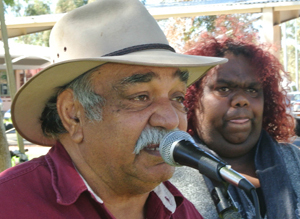 Christa Bartjen, of the NT Council of Social Service, said funding of “lifestyle choices”, which is how Prime Minister Tony Abbott labelled Aborigines’ desire to live on tribal lands, should be seen in the context of allocating government money for car racing facilities. She said competitive tendering for public funding is an obstacle to forming partnerships. Also, tendering cycles are mostly too short. 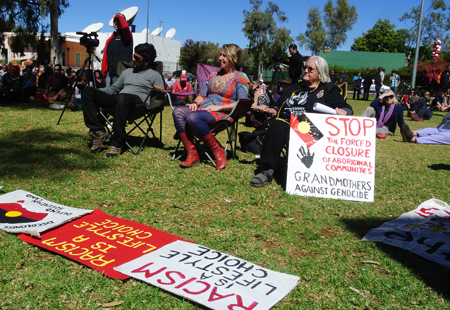 It was Alice Springs’ contribution to a day of nation wide protests. PHOTOS from top: Posing for pix at the end of the rally • Patricia Morton-Thoams • Marlene Hodder and rally banners • Harold Furber and MC of the rally. I’d be interested to read what you consider to be money wasted in the NT. I hope you will include the government as well as your usual kicking of the welfare and indigenous can. Let’s have a bit of detail from your prolific pen. @ Dr Wrongo, well said. Most of the Northern Territory is heavily reliant on welfare. We had visitors from Victoria and SA and they cannot believe the amount of money being wasted here. The Territory can never become a state as is will never stand on its own two feet. Not such a silly response @ Dr Wrongo. Have heard this line as a response before. Yes, while WA receives a return of (proposed) 30% of the GST take, the NT is about 560% the last time I checked. Clearly we are heavily subsidised. While there’s some truth in what you say there are a couple of serious flaws too that get lost in your hyperbole. 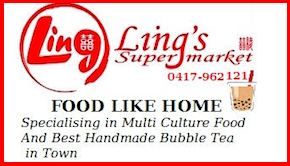 What you facetiously propose would leave a vacuum here in remote Australia for others (China?) to fill. Our military should be based in northern Australia. Sadly this is expensive. Mining and exploration companies that do (or should) actually contribute to the economy need facilities and infrastructure. Communities of a hundred or two, or a handful of people, are outrageously expensive. Small towns dotted around Australia do not have services and facilities that those tiny indigenous outstations take for granted. I know of nurses who visit remote communities in SA’s APY Lands from Darwin on a fortnightly roster. We will all have to learn to live with less. The boom is over, in case you’ve missed the news. 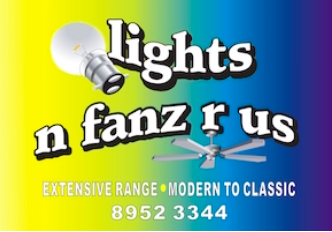 The whole of the Northern Territory is a lifestyle choice. We should be closed down and stop being a drain on the tax dollars of those living in the other states. Indeed Fred the Philistine. One would almost think that trucks will arrive and forcibly remove people from their economically unviable communities. All government is saying is they they are too small and expensive to maintain facilities. When indigenous people cease to rely on white-fellas to keep the power and water running then they can quite happily survive “in country”. Remote cattle stations are not government equipped with health clinics and power stations etc. Indigenous people used to be self reliant. Maybe it’s time that they returned to their old ways. I will be far more understanding too when I see that indigenous councils refuse the millions in mining royalties that must compromise their very being. There are a few isolated cases of elders refusing the lure of the big dollar to destroy their dreaming but they are rare. There has been sufficient royalty money to maintain the smaller communities without the need of the taxpayer putting his hand into his pocket again. People have choices. If you live in remote places that’s fine but you will not have the same facilities as larger places and it is their choice. They can move. To ignore reality remains the principal cause of Fail To Thrive. The march was a campaign for money while doing nothing. Are they campaigning to keep their jobs and money flowing? No one is being forced to leave their land. People who hold titles will not be forced to move away without compensation. The decision to move is for each person to make themselves. Such decisions made regularly all around Australia, in cities, towns, suburbs, villages and rural homes, more often in low employment is merely pointing out that exists a limit to support available, with terms and conditions for the support. Support is provided on terms and conditions for everyone, or it is racism. People living in rural and remote areas often need find their own way to obtain their necessities, support and essential services. WA government speaks honestly, smaller communities, or people living on their own land, may not be able to receive the same support, the same services as those in larger communities. Where population is enough then leases need be provided for most services, or you may not get the services. The demonstrators, even the Central Land Council, are IMHO misleading to promote misunderstanding IF they suggest everything can be achieved, all services provided, without leases. Leases remain central to most services, such as communities in MacDonnell Shire, have they been provided with proper leases yet? Those living distant from the nearest rubbish, water, power, sewerage, medical and other services need provide their own – or travel to where they are. There exists with medical services some limited support available for those who live distant and need these. With education, when smaller communities have enough children they become entitled to receive support for a school, the schools need leases for the land arranged for school buildings and accommodation for the teachers, which can take a while. When establishing Kintore there were enough school age children to qualify for establishing a school. Then CLP government was prepared to send teachers who were prepared to camp out, until better accommodation could be organised. Schools are closed when student numbers drop. Those living close enough to established schools can obtain some support to deliver or bus them to and from their local school. Those in smaller rural communities or housing with children living further from local schools need face and handle hard choices with their children, either school them at home or School of the Air or Correspondence. 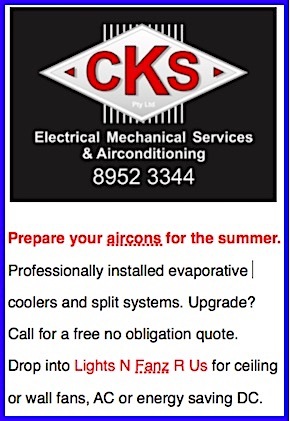 These not so easy, go visit the Alice Springs School of the Air or look online. Else arrange boarding so they attend school, or move closer to schools, or be prosecuted for schooling is compulsory. Mainstream secondary schools are more complicated than primary, so require more students, more staff, more resources than primary schooling, with boarding for secondary schooling quite common. IMHO what is needed is Commonwealth conducting a public review of their support for secondary education. 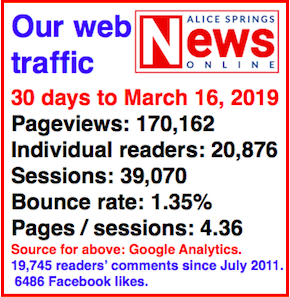 PS: I still love Alice Springs News Online. Hi Evelyne, the adjective “colourful” is meant as a compliment. Erwin, I did think that one day in Alice I will be judged by my clothes! 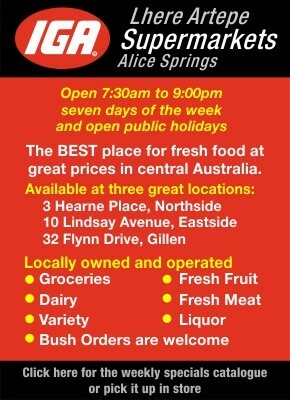 Alice, until now has been known for its non-judgmental community. What do you call an alternative way of life? The rejection of consumerism arises from the recognition that ordinary western consumption habits are destroying the planet; that lives of high consumption are unethical in a world of great human need; and that the meaning of life does not and cannot consist in the consumption or accumulation of material things and fashion.